Since school let out for the summer, we have been focusing on chores around the house and have assigned each kid a couple of daily responsibilities. One of the teenager’s chores is to empty the dishwasher. She repeatedly claimed that she couldn’t tell if the dishes were clean or dirty. I was having trouble believing that excuse…until I accidentally tossed a peanut butter covered spoon in with the clean silverware…Oops! 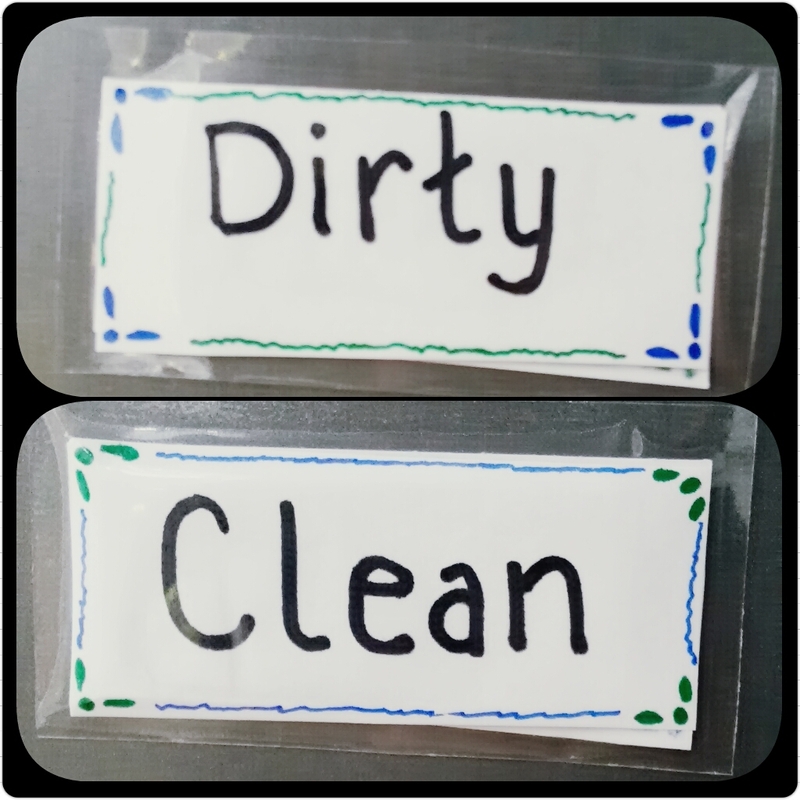 I decided we needed one of those little clean/dirty magnets, but I didn’t really want to pay for one. Plus, I am totally an instant gratification type of person, and I hate waiting for things. I want them NOW 😛 Sooooo, I gathered up my crafty supplies and made one of my own. First, decide what size you want your magnet to be and cut two paper rectangles accordingly. You will also need two pieces of magnet in roughly the same size. 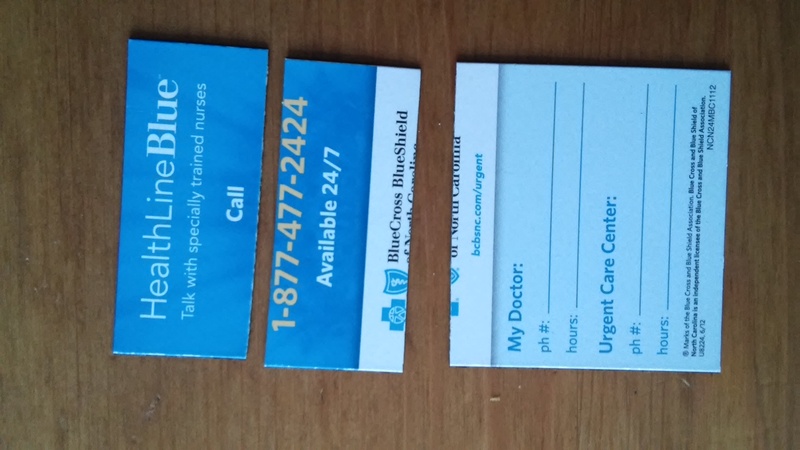 I used a thin magnet that my insurance company sent that has been hanging out on my fridge for about 2 years. 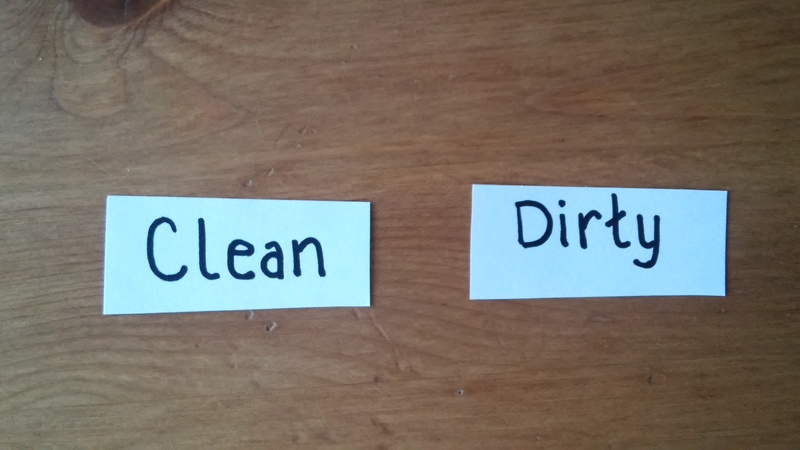 The next step is to write “Clean” on one square of paper and “Dirty” on the other (or use your stickers). I am not much of an artist so I could’t do a lot in the way of decorating, but I did draw a little border around the words to make it a bit more festive. Now we are on to the gluing. 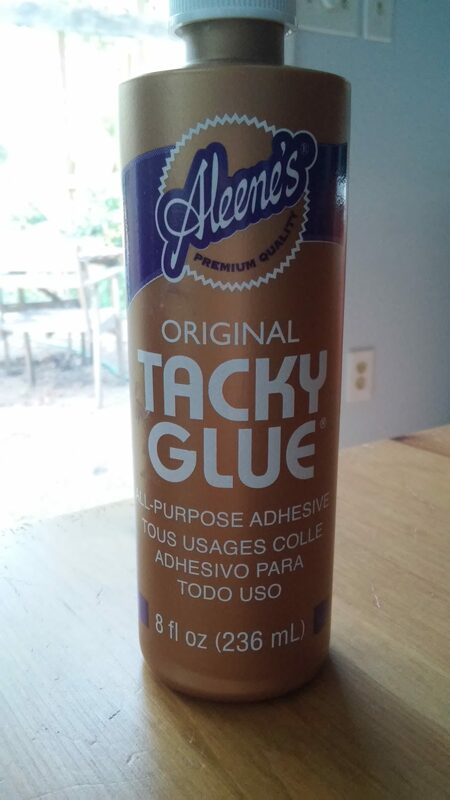 I used my tacky glue for this project, this is a good glue for crafting. It holds quite well, but I will say, the bottle is awfully hard to squeeze. I know I am weak but come on! Anyway, I glued the two magnets together-back to back, and then glued the rectangles on either side of the magnet. So one side says “clean”. Flip. The other side says “dirty”. The last bit is lamination. I bought these self seal laminating sheets for one of the little guy’s school projects, but we never used them so they were just on the bookshelf waiting to be magnetized. I carefully put the magnet on a sheet, folded it over, pressed to seal, and then cut off the excess. Make sure you are careful when placing your magnet on the laminating sheet because you won’t be able to adjust it without jacking up your paper. Boom! A magnet on my dishwasher just 10 minutes after I decided I needed it. How do you keep track of those dishes? 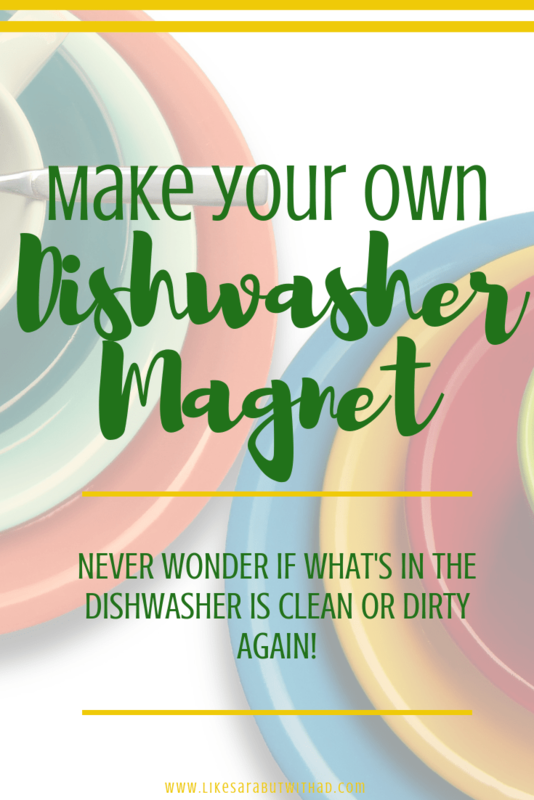 Do you have a dishwasher magnet as well? I’m not a good teacher 😀 It is one magnet with two sides. I cut the magnet into 2 pieces (well 3 really, but I threw one part away) and glued the “wordy” sides together so the magnet could be flipped back and forth to say either clean or dirty. Better explanation? My Hubs had to explain it to me. I swear there are ways in which I am halfway smart, and lots of ways I am not (that is why I can’t ever get out of those Escape Rooms – I am dead weight there). Ooooooh, have you done an escape room before? I wanna try it! That is a great idea! I once put away the entire top shelf of my dishwasher before realized they were dirty, lol! I’ve unintentionally put away dirty silverware thinking they were clean. This would’ve helped me then. This is also a good chore tool for older kids to know when they should help out. Thanks for linking up with Funtastic Friday. It is mainly my daughter’s job to empty so it works well for alerting her! This is so cute! I love this idea because we always have the problem of knowing whether the dishes are clean or dirty.